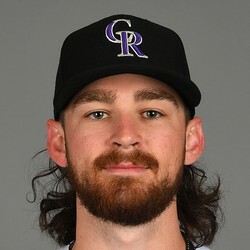 The Rockies have sent Brendan Rodgers down to minor league camp. The 22-year-old was never going to begin the year with the Rockies, but he should debut in the majors at some point this season. The shortstop is blocked by Trevor Story right now and might need an injury or two to get a chance in the big leagues. He could also handle second base if needed. Brendan Rodgers went 1-for-3 with a single and a run scored as the Rockies fell to the White Sox 10-6 on Saturday. Rodgers isn't doing much to stand out this spring, which is somewhat dimming his shine as one of baseball's top prospects. The 22-year-old has major potential once he gets an everyday job in the majors. Second base should have an opening for him later in the season, but the Rockies have recently been slow to committing to youngsters as everyday players. Brendan Rodgers went 2-for-4 with an RBI on Thursday as the Rockies defeated the Cincinnati Reds in Cactus League action. The 21-year-old shortstop is one of the top prospects in all of baseball. The former first round pick has also been playing some second base, which will give him a better chance to get to the big leagues quicker. Rodgers will be playing his home games in Coors Field when he gets to the show, so he's a name to be keeping tabs on. Brendan Rodgers homered in a Cactus League loss to the Los Angeles Angels on Sunday. The two-run shot off Matt Shoemaker was Rodgers' second of the spring. The 21-year-old is considered one of the best offensive prospects in baseball, and he'll get a nice boost in fantasy value from playing his home games at Coors Field upon arrival. He has an outside chance at cracking the big league club this summer. Colorado Rockies shortstop prospect Brendan Rodgers homered against the Diamondbacks on Friday, leading off the bottom of the 10th with a solo shot. In 89 games last year between Single-A and Double-A Rodgers hit .336 with 18 home runs. Combine the bat with his future home games coming at Coors Field and he's one of the top fantasy prospects in baseball right now. Rodgers should once again open the season in Double-A.